One of the best female blitz chess players in the world, Grandmaster Valentina Gunina is also one of the top long-game female chess players as well. With her world record 17/17 perfect score at the Women’s section of the 2010 Moscow Blitz tournament, she put herself on the map and the public has taken notice. Also a prodigy who won all different sections of youth tournaments, she now has recently become the 17th highest rated female chess player in the world, definitely one player to watch out for in the near future. Valentina Gunina learned to play chess from her father at a young age. She became the Russian Champion in almost every single one of the girls age sections at some point. This includes her being the Russian Champion in the Girls’ U-10, U-14, U-16, U-18 and U-20 sections. She also won the 2000 U-12 European Youth Chess Championship, the 2003 U-14 World Youth Championship, the 2004 U-16 European Youth Championship and the 2007 U-18 World Youth Championship. 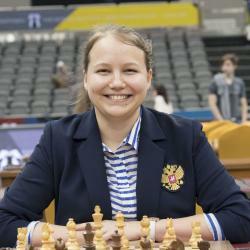 She became a Woman Grandmaster in 2010 and in that same year she scored an amazing 17/17 perfect score at the Women’s section of the 2010 Moscow Blitz tournament. The next year, in 2011, she became a full International Master. She won the 2011 Russian Women’s Superfinals, probably her biggest tournament success of her career so far. In 2012, she won the European Individual Women’s Championship, defeating Anna Muzychuk in the final round. She also won the 2012 European Women’s Blitz Championship a few days later, scoring an impressive 13/15. In 2013 she won the Russian Women’s Superfinals for the second time and in the same year she also earned the full Grandmaster title. Now that she is ranked as the 17th best female chess player in the world, we will definitely be seeing more things to come from her in the near future.